The Fellowship was fortunate enough to obtain a copy of ARCHIE MEETS RAMONES from Archie Comics. The story is by Alex Segura & Matthew Rosenburg, with art and letters by Gisele Lagace, and colors by Ma. Victoria Robado & Digikore Studios. After a bad performance during a battle of the bands, The Archies are on the verge of breaking up. Sabrina stops by and gives Archie a present- The Ramones first record. Looking for inspiration, Archie puts the record on and suddenly the group is transported to 1976 New York City. Suddenly, our shocked heroes run into another surprise…The Ramones themselves! Will the famous band be able to help the Riverdale rockers unlock their true potential as a rock band? As expected, this was a fun read; but this is the first that I can think of that has a moral to the story. Segura and Rosenburg crafted a cute and humorous story that is very enjoyable. Gisele Lagace puts her own spin to the Archie house art style and created a unique and beautiful style. Anybody can pick this up and be quite entertained. Check it out! 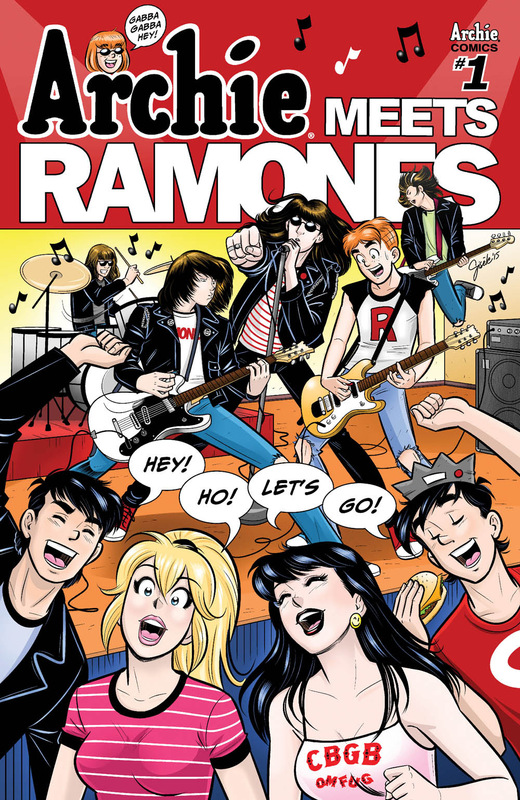 ARCHIE MEETS RAMONES is in stores now or available at www.archiecomics.com.